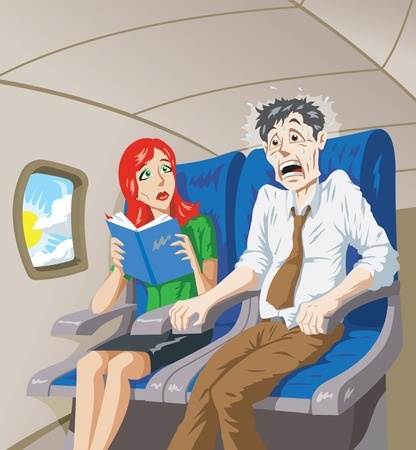 Many of Kay’s clients over the last 29 years have suffered from a fear of flying, also known as “aerophobia”. In fact, the National Institute of Mental Health claims that about 6.5% of Americans suffer from some nervousness about flying, which translates to nearly 22 million people. Fortunately, Kay has helped them overcome this fear and others, typically over the course of three sessions in her Union Street office. “I went to Kay because of my intense fear of flying. I then did brilliantly on an 11-hour flight! “I had a long plane flight ahead of me that was causing me a lot of anxiety. Kay saw me for the first time the day before my flight. The first session was relaxing and helpful. Kay’s setup is very warm and comfortable. She offered me tea and we spent the first hour just going over why I feared flying. She then hypnotized me and recorded the session so I could listen to it before and on the plane flight. “I left Kay’s office feeling calm, without a hint of anticipatory anxiety about the flight. The next day, I flew on a 11-hour flight, cramped in coach, and did brilliantly!! My husband was shocked at the transformation and so grateful to Kay for the work she did. “I had two more sessions after that with Kay — one to tackle weight-loss and the other for general anxiety. Both were very helpful. I highly recommend Kay — she is the real deal. – A.L., San Francisco – Results may vary from person to person. “I now fly regularly for business and pleasure without targeting my anxiety trigger. “After several sessions with you, along with my recorded session you provided, I’m happy to report that I not only took my first trip to Italy last summer, but fly regularly for business and pleasure with little if any issues. “Your technique obviously targeted my anxiety trigger successfully and empowered me to overcome this issue. I hope you enjoy many successes such as mine in your practice. I’m deeply grateful for your assistance.” R.J. – Results may vary from person to person. “She helped my teenage son’s fear of flying after a bad flying experience. “Our family had experienced a really scary flight last spring, when we had to pull up at the last minute while landing. The pilots did not tell us what happened until we had circled around for a while. They entire plane was freaked out. They then told the passengers that they had to pull up off the runway because something was blocking our landing – another plane! Our son thought we pulled up because the engines were failing. The next time we flew, he was convinced—something bad was going to happen and he was anxious the entire flight. “When we first met with Kay, I stayed in the session with him. My normally outgoing son was very uncommunicative about his fear of flying. Because Kay’s a grandmother, she was very calm and knew how to deal with a sensitive kid. The second time we met with Kay, he sat with her on his own and they both agreed it was a very successful session. “Two days later, he flew across the country and he had no problems at all, even with a lot of turbulence on one of the flights.” L.E., San Francisco – Results may vary from person to person.